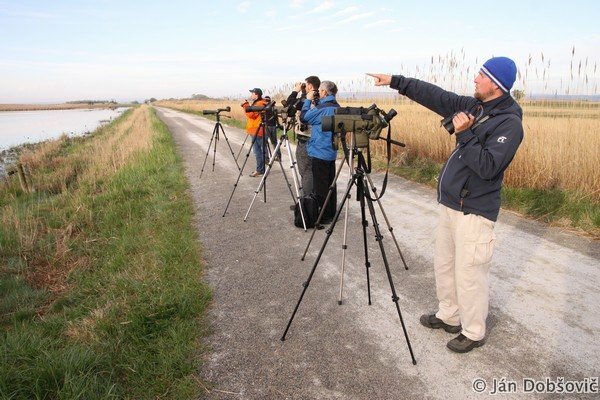 During this weekend we took place on tour to National park Neusiedler See – Seewinkel. Rainy weather was forecasted and that caused that we were only four. In the morning of our first day we had a stop near Podersdorf, where we have seen three Hoopoes. After that we did a stop on shore wetland near Illmitz where we met first birdwatchers. We were told that day before on this site was observed rare bird in Europe – North-American Buff-breasted Sandpiper (Tryngites subruficollis). We were pleased to have a chance to spot such rare bird but not this time. We enjoyed Red-crested Pochards, Shovelers, Lapwings and Snipe as well. But the best sighting came with proud Greylag Geese parents that were leading their yellow goslings. On our route to National Park information center we stopped near one shallow lake, where we observed Avocets, Little Ringed Plovers and Ruffs. The most interesting was an Avocet that was preparing nest place for breeding. On nearby meadow we have found 19 Whimbrels. We parked our car in front of information centre and made short walk to check the sites that are close to it. We heard singing Common Nightingale that returned also here after the spring migration. Amidst other birds we can mention Whinchat and Pied Flycatcher that are not so common in this area. In the meadows man could find Green-winged Orchids (Orchis morio) in bloom. We observed Black-tailed Godwits, Wood Sandpiper and Lapwings on very short distance. After the walk we went to check in to our place of accommodation. Then we had a lunch and trip to Hungarian part of Lake Neusiedler, into the National Park Fertő-Hanság. In Hungary we had incredibly good weather. Along the road we observed Hobby, Little Grebe and big flock of waders. Directly on site we enjoyed the most Common Redshanks in breeding plumage and Marsh Sandpiper as well as this bird is pretty rare in Slovakia. From other bird species we could mention few thousands of Ruffs and few hundreds of Dunlins. We cannot forget tens of Whimbrels, Avocets, Black-tailed Godwits indeed. We observed last two Anas sp. ducks that completed all 7 Anas sp. ducks in the area of Neusiedler See Lake. After nice birdwatching whiles we decided to dine, but we could not resist against short walk in the park. It brought us few more species (Jackdaws, woodpeckers). After dinner we returned back to the guest-house but it still was not the end of our day. We had another while in the field as we tried our luck on calls of birds that are active mostly in night. There was no “booming” Bittern nor Rail or Crakes so we checked the stars with borrowed Swarowski spotting scope. On the first day we observed 94 different bird species. Before breakfast we checked the site that was reported for presence of North-American wader but we had a bad luck again. At least we have seen merciless natural show that included Hooded Crow that killed lost helpless gosling. After breakfast we did a hike to Sandeck. Along the road we observed European Hares and White Donkeys. We have spotted another Hoopoes, Spoonbills and Purple Heron. We stopped beside watching tower where we overlooked near lying area for birds. Then we moved to information centre where Pannonian BirdExperience fair took place. We checked exhibition stands with optics and had a possibility to short talks with Austrian birdwatchers from bird.at and Club 300. Hereby we returned back Swarowski binoculars and spotting scopes that we have borrowed for testing and comparison with our optics. We had a lunch in nearby restaurant and after that we made a trip to Zicksee. Here we observed geese family with 41 goslings, Linnets, Goldfinches, etc. After short break combined with photographing the birds we moved to Langelacke where we observed gull colony. We spotted Common Gulls and Mediterranean Gulls as well. We are not mentioning the other species as Avocets, Black-winged Stilts or Black-tailed Godwit as they were just after two days in the area really the common ones. After walk near Langelacke we had a dinner in restaurant in Illmitz where Club 300 organized special bird identification quiz. The winner was able to identify 18 of 25 species on the photos and won a binoculars. Before sleep we did a short walk again and this day we had a luck to hear a Bittern. Saturday brought us 79 different bird species (overall 100). Early morning before breakfast we joined a group of Austrian ornthologists and made third attempt to spot Buff-breasted Sandpiper. We spotted it just 60 meters from us and that gave us great opportunity to see this rare bird in detail. After breakfast we packed our luggage a decided to visit different type of habitat. Our target area was meadow-steppe habitat with regular presence of Great Bustard. Just a kilometer before the watching tower we stopped by a group of ornithologists that were observing birds of prey. Together with them we had seen Montagu’s Harrier, Black Kite and heard Common Quail from nearby meadow. As we were finally on the tower from where we spotted him. Yes, his majesty, Great Bustard. The distance was comprehensively big, but we could see this large bird. As we checked the right-hand side area we found 10 other Great Bustards and as we moved our spotting scopes back to the first one he started to display. We were observing this large white puffy white ball and totally forgot to check the area around us. We were told that Short-eared Owl was flying by but we didn’t see it. The whole observation of Great Bustards was an energizing experience for us that we will remember for years. And then it came finally. The rain started to pour. It came on third day after it was forecasted but it did not make us any problem as our weekend schedule was in the end. Until now the weather was very pleasant if we are not counting one short shower. On our third day we observed 82 bird species. 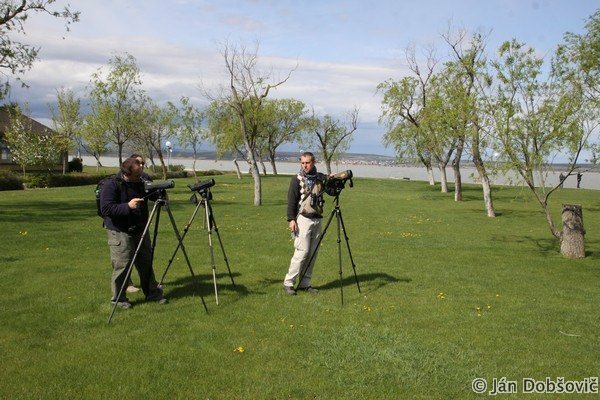 Overall we observed or heard 107 bird species despite we missed plenty of local common species. 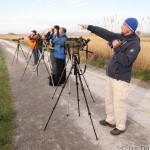 Instead of hunting for the numbers we decided to explore interesting sites to discover the beauty of spring birdwatching in the National Park Neusiedler See – Seewinkel.